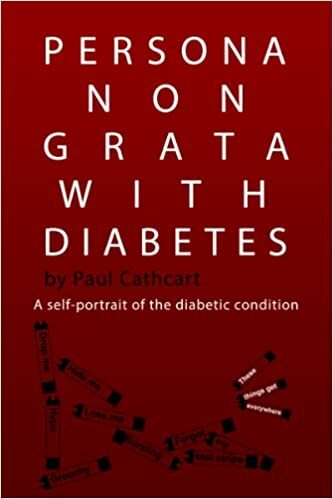 A self-portrait of the diabetic condition, understood as a state-of-being rather than its medical definition. A comedy of frustration! High blood sugar and mood swings? Confirming diabetic emotions. I bought this book in a new attempt to better understand and take control of my disease. I was looking for confirmation of there being others out there who go what I go through, who experience the same kinds of set backs and lows as I do. I found this in PNGWD; I just wasn't expecting it to be so hilarious. Fifty-three million diabetics in Europe alone and all we are offered in public is Diet Coke. They will know when the diabetic uprising occurs, when the cake shops burn and Fanta Zero pours from every tap. I fully expected this to be a non-fiction work of statistics and fact, and was delighted to see it was more of a life story. More importantly, it was filled with colloquialisms and places I know from Glasgow; this made it even more comfortable to relate to since we've both spewed in the same places with blood sugar above the 19 mark. Cathcart's memoirs of his life and condition are written with honesty and exasperation. We see his diagnosis at a young age, wander through his early twenties with him as he tries to make sense of insulin versus alcohol, and later sit uncomfortably as his disease impacts his career. This was all too familiar to me as I remembered sitting back at eleven years old as my friends all scoffed Haribo at sleepovers, getting sick of it at nineteen and necking raspberry vodka slushies in the ABC (later waking up paralysed and dealing with a 45 minute panic before I could move just enough to reach a Toffee Crisp), and finally dealing with the ignorant and myopic "just try harder" lecturers of my adulthood. It's both a relief and an irritant to see this happening to someone else. I really enjoyed reading of Cathcart's helpless conversations with medical professionals who know better. I'm sure we've all had days where we realise these people are not diabetic, and they're giving advice based on scripted methods and teachings, rather than considering us as people with different, varying lifestyles. We've simply got the numpties who think they know about diabetes in the same way that all big sisters think they know how to cut their little brother's hair. His comments on the industry of diabetes, however, are ones I have never taken the time to think of. He's right, of course, that it's a profitable business; of course companies make money from the thousand of test strips we go through a day. I'm probably keeping Lucozade afloat single-handedly, never mind the rest of our hypo army. No wonder we haven't been cured yet. This is an excellent read for a type one diabetic, whether recently diagnosed, or an old veteran like myself. I look forward to the next one.